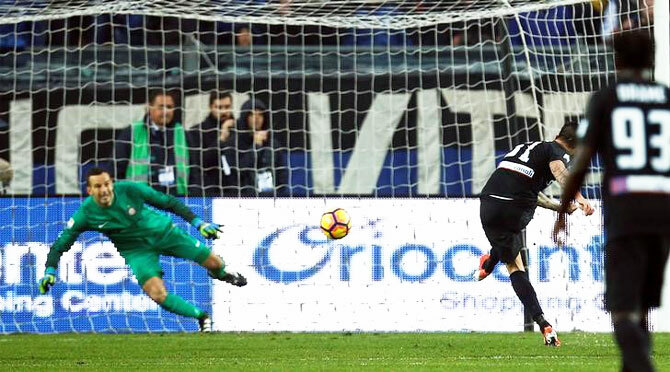 Mauricio Pinilla converted a late penalty to give Atalanta a 2-1 win over Inter Milan and condemn their troubled opponents to a third successive Serie A defeat on Sunday. Napoli, despite having forward Manolo Gabbiadini sent off after half an hour, ended a run of three successive defeats in all competitions with a 2-1 win at bottom club Crotone. Nikola Kalinic scored a hat-trick to lead Fiorentina to a 5-3 win at Cagliari and a last-minute penalty by Adem Ljajic gave Torino a 2-2 draw with Lazio. Inter, who have 11 points from nine games, dropped to 14th in the table after their defeat, heaping more pressure on beleaguered coach Frank de Boer as Thursday's Europa League win over Southampton proved to be only temporary respite. He remains in danger of suffering a similar fate to Gian Piero Gasperini, his opposite number on Sunday, who was fired by Inter after just five games in 2011. Inter got off to a terrible start when Andrea Masiello headed in at the back post to put Atalanta in front after 10 minutes. After a totally ineffective first half, they levelled five minutes after the restart when a free kick was rolled to Eder and the Brazil-born forward scored with a vicious, long-range shot which dipped away from Etrit Berisha. Gasperini was ordered from the touchline for dissent but Atlanta continued to look the more dangerous side and were rewarded with two minutes left when Davide Santon lunged at Franck Kessie and the hosts were awarded a penalty. Inter goalkeeper Samir Handanovic got a hand to Pinilla's shot but could not stop it and the Chilean forward climbed up the protective fencing to celebrate with fans. Jose Callejon put Napoli ahead after 17 minutes at Crotone before Gabbiadini completely lost his temper, aiming a kick at Gian Marco Ferrari in retaliation, and was sent off in the 31st minute. Despite this, Nikola Maksimovic added a second goal following a corner two minutes later and Crotone's 89th-minute reply through Aleandro Rosi was no more than a consolation. The win lifted Napoli to 17 points, four behind leaders Juventus who lost 1-0 at AC Milan on Saturday.